Hi, I’m Dr. Jeff Bynum, an experienced general and cosmetic dentist serving the greater Valrico area including Brandon and Riverview FL. One of the most common requests I get from my dental patients is whiter teeth. I am happy to say that my dental patients are in luck when it comes to teeth whitening because cosmetic dentistry procedures like teeth whitening and porcelain veneers are safe, effective, and affordable. Some Riverview FL patients might be interested in bleaching their teeth at home. There are many affordable teeth whitening products available at local drugstores. Remember that even though you are doing this procedure at home, you should discuss it with your Valrico dentist and report any sensitivity that may occur. 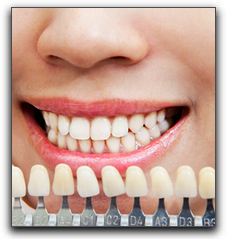 There are many dentists in the Valrico area that offer in-office teeth bleaching which can often be done in one visit. Riverview FL residents who do in-office bleaching usually appreciate the care that is given to protect the soft tissues of the mouth from the bleaching agent. As you can see, there are a lot of great ways to keep your teeth nice and white here in Valrico. If you’re interested in any of these whitening methods or a complete smile makeover, call Five Star Dental Care at 813-653-2273. Our knowledgeable staff will schedule a cosmetic dentistry consultation at your convenience. This entry was posted on Friday, May 3rd, 2013 at 10:58 am	and is filed under Tooth Whitening. You can follow any responses to this entry through the RSS 2.0 feed. Both comments and pings are currently closed.